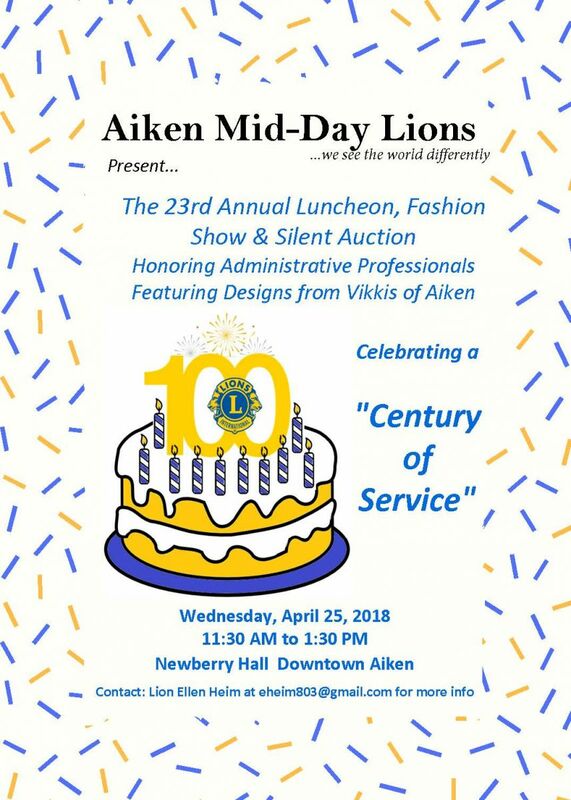 The Aiken Mid-Day Lions Club held its 23rd annual Luncheon, Fashion Show and Silent Auction to honor administrative professionals April 25, 2018 at Newberry Hall in downtown Aiken. The theme for this year’s event was "Century of Service" in celebration of 100 years of Lionism. Our models showcased designs from Vikkis which is located at 1501 Whiskey Rd in Aiken. Andrew Siders served as the Masters of Ceremony for the event. We would like to thank all of our sponsors, donors and local businesses that supported this event through silent auction donations. Proceeds from the event will benefit the Leader Dog Program, the S.C. Lions Charitable Services and many local charities including Salvation Army, The Boys & Girls Club, Nurture Home, The Cumbee Center, Helping Hands Childrens Center. Club members also donate time and talent as well as treasure by sponsoring mentoring and educational opportunities with many of these organizations.